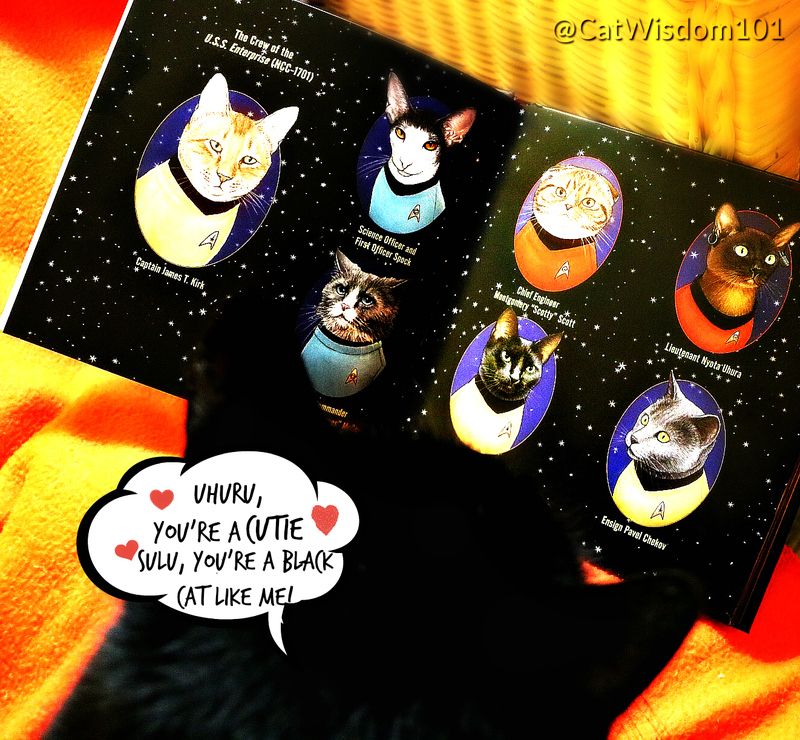 Good day darrrlings, it’s your Scottish cat, Clyde with a new book Star Trek Cats with picture purrfect illustrations by author Jenny Parks. Check out her website for links to pre-order the book. The official launch date is February 28, 2017. She also has some fab kitty merch from her wide selection of pop culture pussycats. 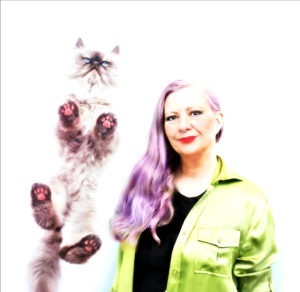 She has a knack for capturing the essence of the Star Trek character in this pitch purrfect homage. The orange tabby is so Captain Kirk and the big-eared Oriental short hair as our favorite Vulcan is spot on Spock. My favorite is of course my fellow Scotsman, Scotty. 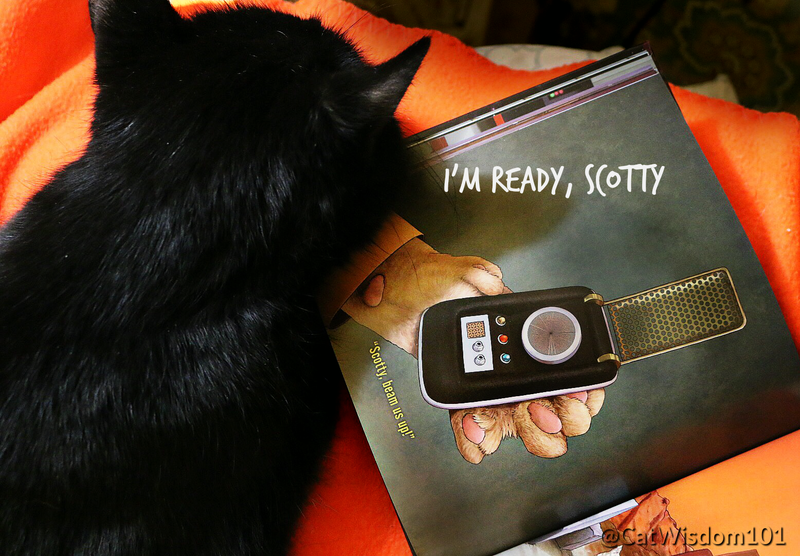 Star Trek Cats is for cats, humans and non-humans and is feline approved and recommended. The nifty hardcover book covers an assortment of episodes from the original TV series. The list is at the back of the book but Trekkies will easily recognize the scenes. Everything is naturally better with cats. Excuse me, I have some more reading to do but before I go I’d like to thank my mentor and maestro, Merlin. He taught me the value of reading books and writing honest book reviews. 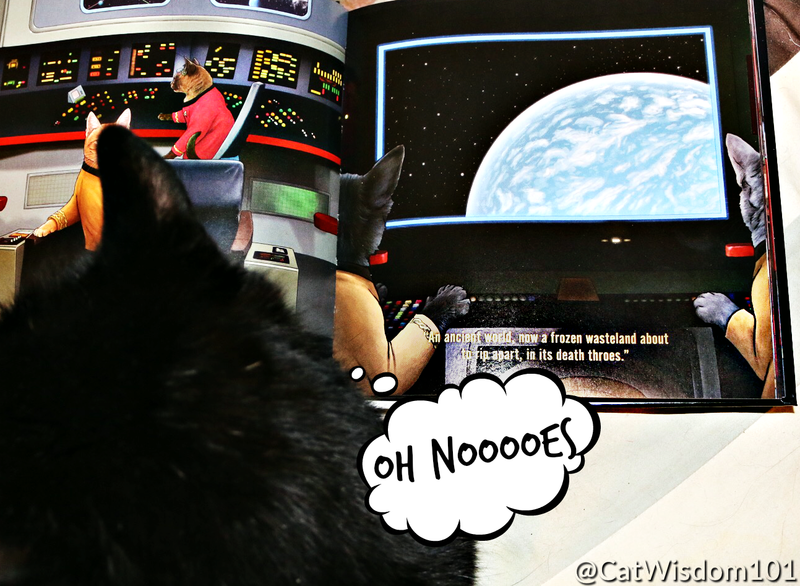 FTC disclaimer: We received a review copy of Star Trek Cats which in no way influenced our views. At Cat Wisdom 101 we only share content we feel is of value to our readers. Have a good week and remember: LIVE LONG AND PROSPURR! My mom, Layla who loves the original TV series more than the movies reminded me there was an episode with black cats. Apparently, in the 1967 episode for Halloween, Captain Kirk gets lured into a spooky house with wizard zombies, witches and a giant black cat. Woooo. Enjoy the clip. But as a black cat advocate must say this episode reinforcing the negative stereotype about black cats, no? OMC! That is clevfur to make a book with kitty characters! I loved the clip, I’ve seen all the episodes, I don’t remember this one, will have to watch again. I don’t think it hurts black cats images. Who else but a black cat would be brave enough to do the show? That is such a cute book! Looks like I’m gonna order one and watch the series again tonight! Woo! Hoo! Mes gots to gets Mommy to gets this book! Did yous knows that being a Trekkie is genetic? Mommy is a wild fan, as is all 3 of my human brothers and the 5 grand kiddies! Mes sees Merlin in my dreams! oh how cool is that? I want it !!!!! Ha! I think I have seen every Star Trek and will watch the marathons when they come on. Pretty nifty book for sure! Ellen, this is for you then. This is super cute. We could tell which one was Spock by his ears. Yes! Isn’t he a purrfect choice? OMC! The mom will want this for sure! LOVE IT!!!! It should include a copy of Cmd. Data’s poem, Ode to Spot!!!!! it’s awesome. I don’t know that one. Must Google it, thanks! This book is predestined to be a big hit. What a huge fan base it has! It’s already heading to the top of Amazon and it’s not even released yet. LOL we are sooo from the same generation apparently! I love the TV series better also! This book sounds like a real hoot! Thank you for sharing the fun Clyde! Luvs and peace to all thru out the Galaxy! It looks like it! Much luvs to you from Clyde and the gang. Oooooooooo! Looks like a great book. That is so cute, I need to get it for my hubby- he is a trekkie. 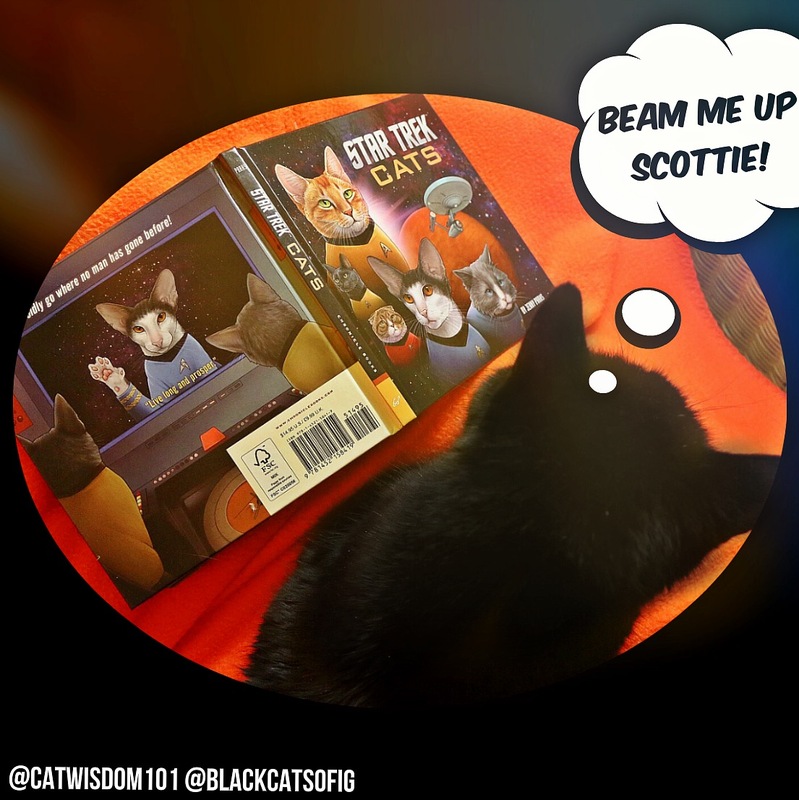 Such a clever idea for a fabulous book….and I am sure I saw every Star Trek episode but don’t remember that clip!! I remember that clip! Watched every episode. Loved the TV series so much more than the movies. Me too! You’d love the book. HA! Adorable 🙂 I love it! Clyde is enjoying his new role and happy as a clam these days. That was a very strange Star Trek clip! Yes, and you were so early commenting you missed the edited book review.